What happens when one takes a game from the platformer genre, keeps gravity intact, and takes away all jumping whatsoever? Why EDGE comes out of course. EDGE is a game on both iOS and Steam created by the studio Mobigame; the Steam version was published by Two Tribes. Two Tribes are responsible for the popular egg collecting game, Toki Tori. 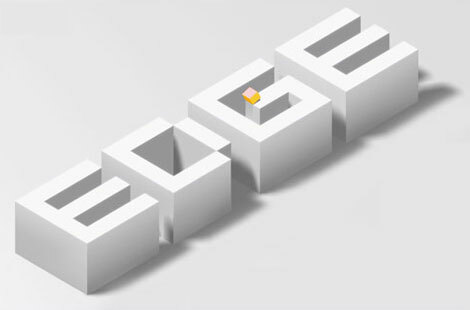 Edge consists of navigating a flashing cube across various obstacles to reach an end point. This is done by “rolling” the cube, in a sense, through grey and white alleyways, tunnels, and labyrinths, among other pathways; this is the core gameplay, but Mobigame throws in quite a few twists and turns to keep the game interesting, and above all, entertaining. The first of which is thrown in is the most obvious, shifting platforms, the staple of all platforming games. 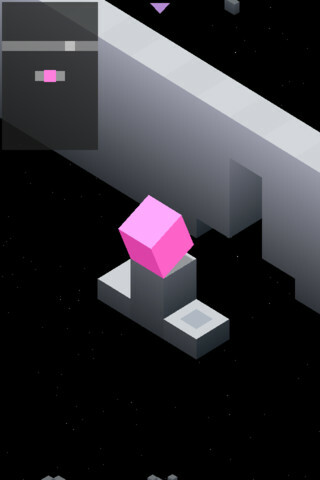 In this title, platforms will on their own, slide, ascend, descend, or follow predetermined paths. Most of these actions are automatic, the other case of these events are through the use of buttons strewn throughout the entire game. These buttons will trigger a variety of events which ranges from the simple one directional movement of a block to a completely orchestrated set a pathways in which the player must traverse. Along the way, the player will also pick up small cubes called prisms, which, in conjunction with a good time will display mastery of the stage. Through all of this mayhem, the player must learn to master a skill that will be persistently appearing in the game, and that is, as the name implies, edging. 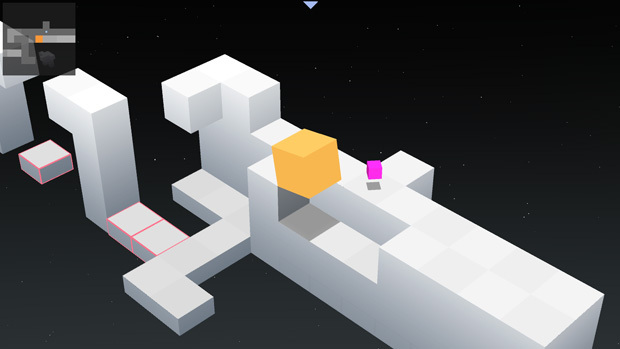 Edging is when the player moves in a direction and keeps the flashing little cube between falling back to rest and ascending to the next height. Haven’t mastered the concept yet in the game, or don’t know when to use it? Fear not, because the game offers hints through floating question marks that will show a ghost image of your cube and guide it through the given obstacle. The controls in the game are very simple, and incredibly solid. On a keyboard, they consist of the up, down, right and left arrow keys. This can prove to be a bit confusing at first since the game is in an isometric view, but one should be able to pick up after getting their bearings within the game. If the default of up going northeast is too troubling, in the options, up can also be set to northwest. The title also supports the use of an Xbox 360 controller as well. The game offers forty-eight stages which the player must trek through, in which the difficulty will ramp up gradually in which there won’t be an incredibly difficult challenge until about stage 20 or so, and up. It’ll begin with the moving from point A to point B with little to no trouble. The game will gradually add more twists and turns, such as timing when to roll onto a platform to continue progress. Buttons will also be added in gradually, but it’s not the general use of buttons which can prove to be difficult, but what they trigger. They can be as simple as pushing you in the direction of the goal, however, they can be downright nasty, and trigger a set of blocks to push the cube off the edge and the player will have to think fast and move swiftly in the hopes of not falling off. All in all, the game is a great package, now with an “extended” set of levels to keep the entertainment going after beating the initial forty-eight stages, and this title will sufficiently entertain those needing to burn about a half hour.